The building commonly called the Basilica, partially explored through tunnels between 1739 and 1761, was, as it is apparent from the descriptions and a map of the time, a large rectangular room, divided into three parts by rows of columns. On the back wall there was an exedra flanked by two smaller niches, where they were shown "Theseus with the Minotaur"and "Hercules with Telefo". 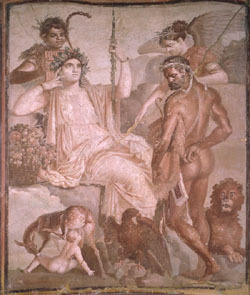 All the walls, moreover, were decorated with an interesting series of paintings, some of which have been removed and are now at the National Archaeological Museum of Naples, while others have been irretrievably lost. In the building was also found a large number of bronze and marble sculptures, including two equestrian statues of Marcus Nonius Balbus, the statue-portrait of the father, of his mother and daughters and some imperial statues.